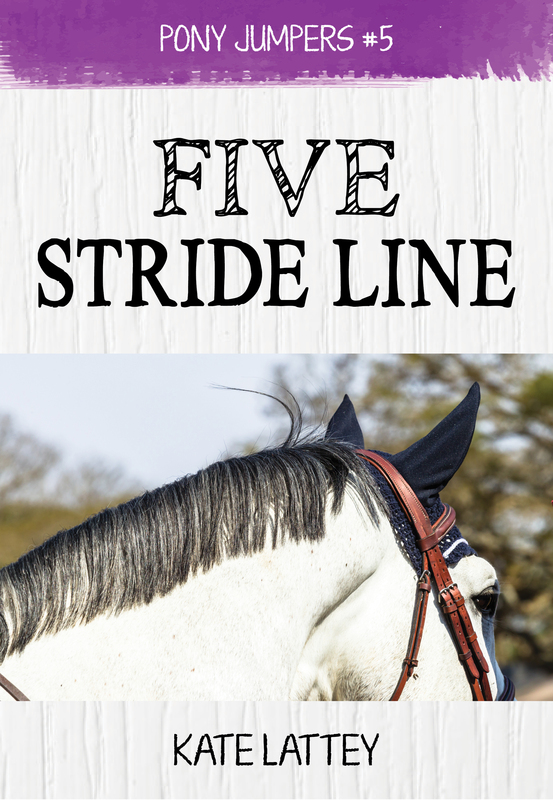 Taking part in another Blog Hop, this one from Christine at Horse Country Book! “There’s a Pony Club rally tomorrow,” I told Katy the following afternoon as we groomed our ponies before our ride. “Nervous riders make nervous horses,” I said, remembering how petrified Alyssa was of her pony. “Ugh. Parents are stupid,” Katy muttered, just as her mother appeared around the side of the building, leading the roan pony we’d been discussing. I’d have been mortified if my mother heard me say anything like that, but Deb seemed to take the insults for granted. “I hope you’re talking about your father, not me,” was all she said as she tied Rebel to a ring in the wall and started taking his covers off. “Actually I was talking about the people who own Rascal,” Katy told her mother. “Rebel,” I said, but my correction fell again on deaf ears. “They’ll be here in half an hour,” Deb told Katy, who looked stunned. “It’s Alyssa,” I interjected, but neither of them heard me. Deb sighed and started explaining that the owners thought they might want to take him to Pony Club themselves, and she’d had to convince them to come and ride him again first. Katy made a lot of grumpy interruptions and I just listened wryly to their argument as I finished picking out Squib’s hooves, checking carefully around his white line for any embedded stones. Katy’s arena had quite a bit of fine gravel mixed into the surface, and it was notorious for getting trapped inside Squib’s white line, which could cause bruising or abscesses if I wasn’t vigilant about it. Once his hooves were done, I lifted Squib’s saddle onto his back, setting it too far forward and then sliding it back to make sure the hairs under his saddle blanket didn’t get ruffled the wrong way. Reaching under his belly for the girth, I pulled it up snugly but not too tight, then gave his solid neck a firm pat. Deb went off to get some brushes for Rebel, and Katy looked over at me with a pained expression. “Speaking of that, have you heard from Tess?” I asked, but Katy shook her head. We were quiet for a while then as we finished tacking up our ponies, both lost in thought. Tess was another rider who competed at lots of the same shows as we did, usually riding her sister Hayley’s outgrown show jumping pony Misty. Misty was even more of a handful than Squib on his worst days, and Tess didn’t look like she had much fun riding him, but she’d been bullied into it by her sister. I didn’t have much time for Hayley, who had a mean streak, but she’d started having unexplained seizures lately and I knew Tess was worried about her. Personally I thought it might provide a good wake-up call for Hayley to have to deal with her own weakness, since she was always so busy calling everyone else out on theirs, but I didn’t want to say that out loud and appear heartless. “You forgot your martingale again,” Katy told me as she put her helmet on and snapped up the chinstrap. “I thought I’d try riding without it today,” I replied, keeping my voice casual. I’d never ridden Squib in anything other than a snaffle bridle until I’d first met Katy, and although the martingale and copper roller bit that she’d added to my tack had helped me keep my pony under control, I didn’t want to rely on them forever. “We’ll be fine,” I assured my friend, rubbing Squib’s head affectionately as I tightened his girth another hole and picked up my own helmet. There was no malice in my pony, just a lack of training. And as his owner and rider, it was my job to train him so that he didn’t need any artificial aids to keep him under control. Horses are remarkably sensitive animals, and I’d watched countless videos in the past few days of riders who’d trained hot, excitable horses that were considered unruly or dangerous and made them into balanced, relaxed and willing partners, simply by removing unnecessary tack items. Squib butted me with his nose, and waited as I swung myself into the saddle and followed Katy into the arena. The full novel will be out on 8 August 2015. 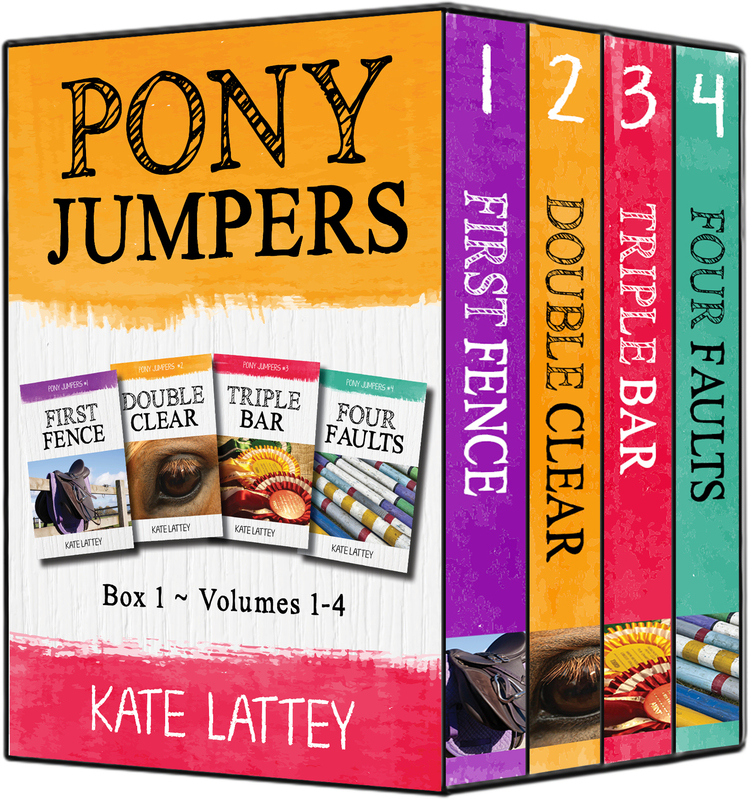 In the meantime if you haven’t already read books 1-4 in the Pony Jumpers series, you can get all 4-in-1 in a discounted box set on Amazon! Reads like a great series, Kate! I love that there is a lot of information around their interactions. Thanks for taking part in the blog hop!